The lovers, the dreamers and cheese. The Muppets are in a difficult spot. Because they were so big a part of growing up for so many of us, because they are so tied in to our nostalgia, we want their every incarnation to speak directly to our inner child. 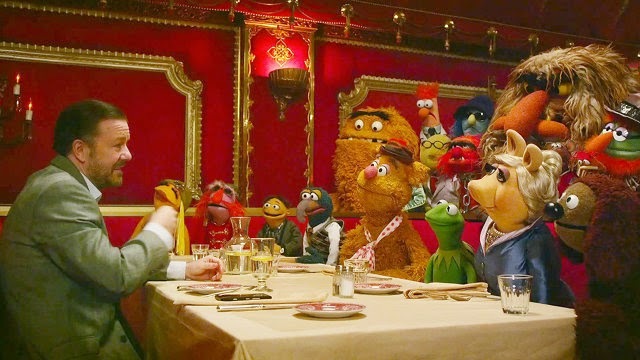 2011's The Muppets worked very, very hard to address these feelings to the detriment of the movie -- it was so busy reminding us that the Muppets are special and that the Muppets matter that it failed to spend enough time on reminding us why the Muppets are special or why the Muppets matter. I suspect this is all a result of their feature film debut, The Muppet Movie. That's the movie so many of us are thinking of when we talk about how we want anything Muppet-related to have "heart." The Muppet Movie is so good that it cast a shadow over everything else the characters ever did. Because when you think about it, The Muppet Show is what actually introduced us all to Kermit, Fozzie, Piggy and the gang, and it was never about "heart." It was all about making us laugh and entertaining us as much as possible. It was about hacky vaudeville jokes and musical numbers that undercut their own importance with absurd visual gags or behind-the-scenes chaos that spilled out onto the stage. It was about putting on a great show. 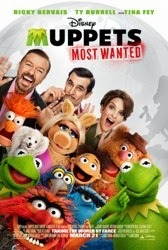 Muppets Most Wanted, the follow-up to the 2011 reboot, is much more in the spirit of those old Muppet Shows than the a heartwarming nostalgia fest of its predecessor. While it certainly manages to sneak in some morals about friendship and the importance of having boundaries set for us (kids, listen to your parents), it's mostly interested in being a zany comedy. At that, it succeeds. With a little more self-reflexivity, it could have been the Gremlins 2 of the Muppet movies. After an opening number that openly references the mercenary nature of sequels and the fact that they're rarely as good (the song also reminds us that the movie was once called The Muppets Again, which is a better title), the plot kicks in: the gang signs up with a new tour manager, Dominic Badguy (pronounced Bad-jee -- it's French; he's played by Ricky Gervais), who begins booking them around the world. At the same time, Constantine -- the most dangerous frog in the world and a dead ringer for Kermit -- has escaped from a Siberian gulag and forces Kermit to take his place. The rest of the Muppets fail to notice the change in this new "Kermit," especially now that he's letting them have and do whatever they want. 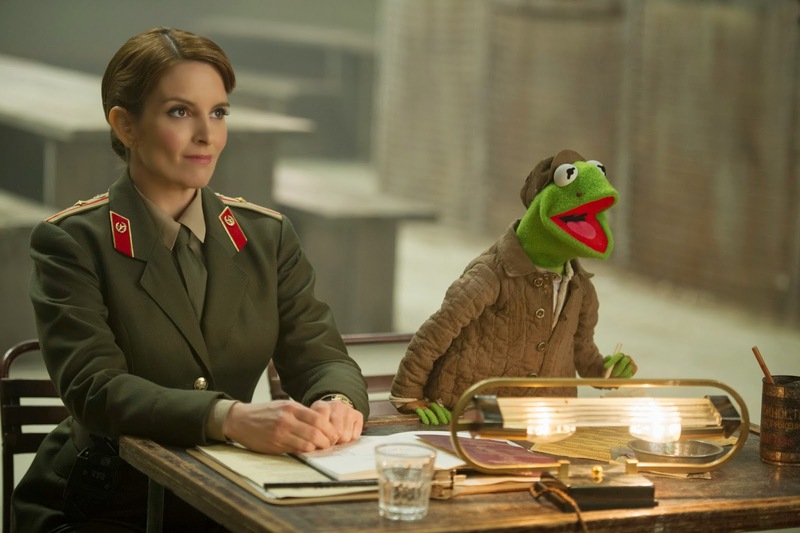 While a French policeman (a funny Ty Burrell) and Sam the Eagle attempt to solve the robberies that are taking place everywhere the Muppets perform, Kermit is tasked by a guard (Tina Fey) to direct the annual Gulag revue. Will the Muppets notice their friend is missing? Will Piggy marry an imposter? Will Danny Trejo learn the choreography to "I Hope I Get It" from A Chorus Line? All of these questions and more will be answered. More than maybe any previous Muppet movie (save perhaps The Great Muppet Caper, to which this film owes a lot -- more on that in a second), Muppets Most Wanted emphasizes comedy above anything else. The result is arguably the funniest Muppet movie ever made, even if it's not the most resonant. Evil Muppet Constantine is this approach personified; from his terrible attempts at doing Kermit's American accent to the copious amounts of physical puppet comedy (it's a thing) in which he takes part, the character scores a lot of laughs. He also gets far too much screen time -- probably as much as Kermit, despite the fact that it's not supposed to be his movie. Director James Bobin, who once again co-wrote the script with Nicholas Stoller, is more interested in scoring laughs than in being precious about the story. It's nice to see him embrace the anarchy a little. Like Star Trek Into Darkness, this is a reboot sequel that draws on past sequels for its plot. Unlike Star Trek Into Darkness, it does not live or die by these references and never feels overly familiar, even when it is. The movie borrows liberally from both The Great Muppet Caper (there are thieves and a heist that must be stopped; Muppets have to prove their own innocence) and Muppets Take Manhattan ("Together Again" gets a reprise, a wedding between Kermit and Piggy plays a major part in the plot despite the fact that they were married four movies ago; because these new movies are a soft reboot I wouldn't even bring it up except that a character acknowledges in Muppets Most Wanted that it's technically the seventh sequel and therefore acknowledges what came before). It wisely avoids borrowing from Muppets From Space, unless you count the presence of Ray Liotta. Speaking of which, the human performances are, for the most part, fun. One of my issues with The Muppets (which was a movie I liked) was that it devoted a lot of its running time to the relationship woes of Jason Segel and Amy Adams, two humans I didn't particularly care about (that movie actually had way too many protagonists and conflicts it was trying to serve). That's not the case this time. 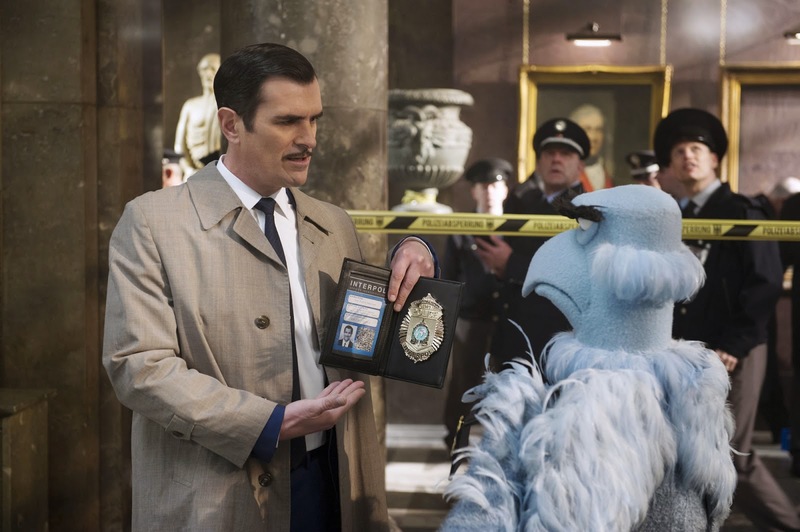 Ty Burrell doesn't shy away from being a ridiculous stereotype, but the way he is paired opposite Sam the Eagle gives the pair their very own mismatched buddy cop movie that's fun anytime it's on screen. Tina Fey is fun, too, in the way she puts air quotes around her performance without necessarily winking at the camera. Only Ricky Gervais falls flat in that he's neither funny nor given the opportunity to be so. He and Constantine get one cute musical number together, but like a few of the movie's songs (which are again composed by Flight of the Conchords' Bret McKenzie and are really good) it serves mostly as a detour. The best musical sequences in the movie either a) tell us something about the character or b) advance the plot. Gervais' number does nothing but reinforce a a half-baked "Number 2" subplot that never catches fire. And, sadly, there's nothing as show-stoppingly good as "Life's a Happy Song" this time around. This being a Muppet movie, there are a ton of cameos that range from fun (Celine Dion is a running joke, Stanley Tucci is funny and this is the first Muppet movie to feature an appearance by Til Schweiger) to awkward (no more accents, Chloe Grace Moretz) to pretty much pointless. Don't get me wrong -- my five-year old son was jumping out of his seat when Toby Jones came on screen. "Is that Miranda Richardson?!?" he shouted. "And FRANK LANGELLA??" To be fair, Frank Langella gets one of the biggest laughs. But it's just one example of something that JB pointed out earlier this week when discussing the movie: many of its jokes will go right over the heads of the young children at whom it is presumably targeted. My son has no idea why "Good night, Danny Trejo" is one of the funniest lines I'm going to hear in a movie this year. Some of the references are funny enough in their adult-ness, whether it's visual nods to The Shining or The Shawshank Redemption, but they're not much more than that -- references. The movie doesn't lean too heavily on them as a source of humor; they're more like little background gags. Initially, I wanted to point out that the joke of a Seventh Seal reference (the one JB mentioned in his column) seems to only be that the filmmakers referencing Bergman in a kids' movie. But the more I thought about it, the funnier it became. Of course the Swedish Chef would picture life as a Bergman film. He's Swedish. What people sometimes forget is that the Muppets were not originally designed as exclusively children's entertainment -- they first appeared doing sketches on Saturday Night Live for crying out loud. And yes, those appearances were a short-lived disaster, but it's evidence that Jim Henson was trying to create a more "adult" version of his beloved Sesame Street puppets. It's easy to get confused now because they're owned by Disney and merchandised to kids like crazy, but there was nothing child-specific about the old Muppet Show. It was true family entertainment, where kids could enjoy funny puppets and adults could laugh at a bear performing Catskills comedy opposite Dinah Shore. 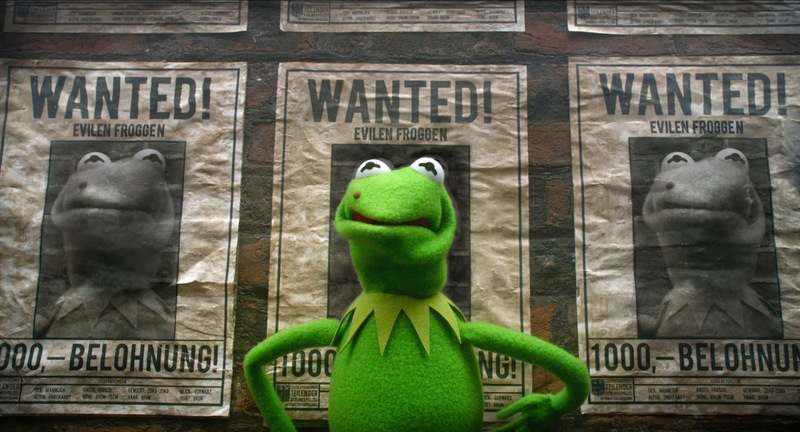 Muppets Most Wanted does the best job since The Muppet Movie of capturing the old funny-for-adults feel. On the flipside, I suspect it's going to leave kids a little cold. Muppets Most Wanted is not great. It is fun, it is funny and it is very entertaining, but it neither strives for nor achieves greatness. That's a tough thing for some of us to reconcile, because we want every Muppet movie to be like a gift. In its own way, Muppets Most Wanted is a kind of gift. It just happens to be a joy buzzer. What did you think of the Monsters University short?